Langhorne Re is a global reinsurer targeting large in-force life and annuity blocks. The company is capitalized with $780 million of long-term equity capital commitments from Reinsurance Group of America, Incorporated (RGA), RenaissanceRe Holdings Ltd. (RenaissanceRe) and other well-regarded financial institutions. 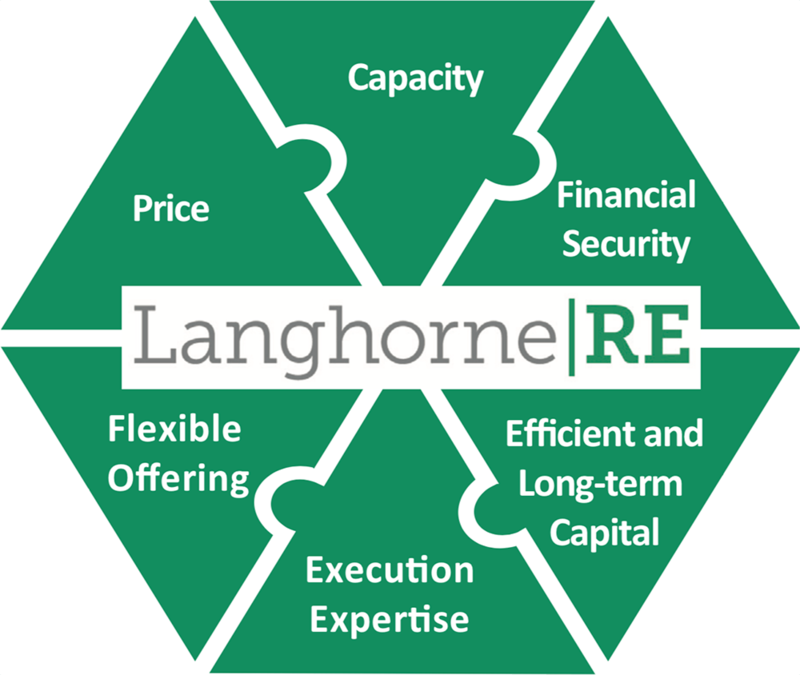 Langhorne Re will combine a strong long-term capital base with underwriting and administration from RGA and RenaissanceRe, as well as third-party capital management support from investment managers with successful track records, to acquire large in-force life and annuity blocks, allowing clients to de-risk and optimize their capital management. Headquartered in Bermuda, Langhorne Re will have insurance operating entities in Bermuda and the U.S. Powered by the complementary and industry-leading capacities of RGA and RenaissanceRe, Langhorne Re is uniquely positioned to provide competitive and flexible solutions that will benefit both clients and policyholders from a long-term approach. Attractive and competitive price to clients due to its efficient capital and variable expense structure. Robust infrastructure and committed capital in place with capacity to support complex multi-billion legacy blocks in the market, enabling clients to interact with one counterparty only. Institutional-grade risk management and conventional asset strategies that support long-term obligations, providing financial security to clients. Efficient and long-term committed capital provided by large, highly respected financial institutions matching the long-term nature of the underlying blocks, which enables management to focus on clients and strong stewardship. Execution expertise provided by highly skilled management and board combined with the ability to leverage RGA’s deep life and annuity expertise and market position and RenRe’s expertise in managing third-party capital. Flexible offering with focus on large transactions, providing scale to deliver highly tailored solutions. For more information, contact your Business Development representative from our service provider RGA or by email to ir@langhornere.com.